I have several blogs in my files that I’ve not yet shared. The info below is no longer “news” but it should be interesting and helpful to some, so I’m posting it for you today. Happy holidays! The Irish Architecture Foundation (IAF) does an outstanding job organizing its annual Open House event. In 2018, they held it October 12–14. Open House spans three days and allows thousands of citizens to visit architectural wonders that are usually not accessible to the public. Over 170 tours and events were open to the public–all for free and most with architects, trained historians, or other experts as guides. Although this happened six weeks ago, I’m posting it now since I like to have a record of what I’ve seen. I’ve attended five of these Open Houses, I believe, and you can find photos from other years by running a search for “Open House” on this site. Despite the dreary rain on Saturday the IAF army of volunteers opened sites all across Dublin. Aongus and I benefitted, as lines were shorter. We took advantage of having Aongus’ car to stay dryer and see more sites than we could by foot. This means we visited more outlying areas than I’d originally planned. We normally walk or take Dublin Bikes. On Sunday the sun came out, but not until after a cold wait for the opening of 14 Henrietta Street. The crowds were fierce on Sunday, and I even encountered a few grouchy folks with a sense of entitlement. I tried to cheerfully point out that the long wait times were due to the popularity and success of the event and that all the people organizing the events and running the sites were volunteering their time. That sense of entitlement is an ugly thing. Putting that aside, I really enjoyed myself and have provided photos of the seven sites I managed to visit. The first site we went to was Belvedere House, which used ot house the boys’ school that was the rival of the one Aongus attended for secondary school. The tour was full, so we actually just saw the lobby in our initial visit, but we returned later and got the tour and more photos. This is a social housing community with an iconic design that was replicated in many other parts of Dublin. As it is so stylized, it seems to many people to be outdated. This particular set of Villas is being torn down and new housing built. There was a photographic exhibition in one of the flats, documenting families who used to live here. A few of the flats still have residents, who await new homes in the construction underway nearby. This project was designed by de Siún Architects and constructed in 2018 at 25 Ash St., Merchants Quay, Dublin 8. Michael de Siún has shown his own home before, very near to this one, and it is an architectural gem. Such clever detailing to make small spaces feel spacious and appealing. I felt that a product Aongus and I had seen at the London Building Centre might be usefully applied to the project, and I forwarded information on it to the architectural design team by email. This city park was designed by Áit Urbanism + Landscape / DCC Parks & Landscape Services and constructed in 2017 on Cork St, in Dublin 8. Despite the rain, we found the park design to be fun and festive. There were even some kids besides Aongus out playing. We rounded off our day with dinner on Camden Street, at Damascus Gate. According to the Open House website, “Weaver Park represents one of the primary objectives arising from Dublin City Council’s “The Liberties Greening Strategy”. This strategy identified a derelict site, formerly occupied by the Chamber Court Flats, which offered a significant opportunity for the provision of a landmark public amenity. 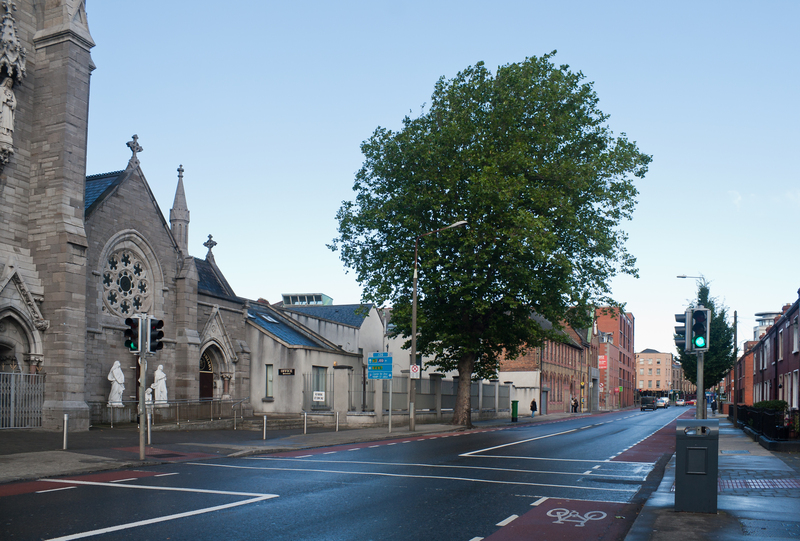 In making the site available for redevelopment, Dublin City Council was responding to the campaigns of local community groups who had long seen the potential in this space. The brief given to Áit Urbanism + Landscape underlined the importance of a participative process that engaged with these local groups, so that the community’s requirements could be understood and delivered through an informed design. Weaver Park is therefore a distillation of the community’s aspirations with inclusivity at its core. The design delivers a hive of activity within a context that will be sylvanic and ecologically functional in time. The fulcrum of the park is a 40-year-old Quercus palustris; this beautiful Oak tree now provides an instant maturity and a new focal point on the Cork Street landscape. It is an icon for the greening of The Liberties. This building was a stately-home-turned-tenement. From housing one wealthy family at its prime, this home eventually held a hundred people at once. I shutter to imagine. Watching “Call the Midwife” during my subsequent writing retreat gave me a glimpse into what such urban density would have looked like. It’s an excellent series that illustrates history as well as truest loving people. So seldom can I bear to watch television, and particularly Netflix, due to its grim and gritty culture. This show, however, is a true delight despite drawing tears. Back to the house in Dublin, though, where you can see for yourself most any day by paying an admission fee. For Open House Sunday, entry was free but the tour abbreviated. And there was a line around the block when it opened Sunday morning! It was originally built in the 1740s at 14 Henrietta Street, Dublin 1. The renovation that has just been opened was designed by Shaffrey Architects. This work converted the house into a museum that now showcases how the spaces would have looked both at the building’s prime and high and when it was packed to the gills. The house is in eyeshot of Linenhall, where my DIT staff office is located and I had a bird’s eye view of the renovations as they progressed. I kept a keen eye as the roof was repaired, a fire stair added, and the brick on rear of the house repointed. Just one block from my apartment in Dublin, this stately brick building gleams with love and civic pride. Originally designed by Carroll and Batchelor 1901 and built in 1901, The Richmond was refurbished in 2016 by Kavanagh Tuite. It is located near my own flat, at No. 1 North Brunswick St, Dublin 7. This was not my first tour of the building, but I learn new things each time. Meeting Grafton Architects: Irish Ladies Leading the Way! Shannon Chance with Shelley McNamara and Yvonne Farrell of Dublin-based Grafton Architects. I finally got to meet Shelley McNamara and Yvonne Farrell, founders of Grafton Architects and designers of my home here in Dublin. You may recall blogs I posted in October 2012 titled Hats off to Grafton Architects, a post about sun angles in winter, and a video clip I made shortly after moving into “my Dublin Castle.” I have attached my apartment tour which is quite goofy. In it, explained features unique to Ireland and the EU, but I called the water tank “electric storage.” That’s factually true, but here they use the term just for the wall heaters that heat bricks in the night, when electricity costs less, and radiate that heat our during the day. I learned more about electric storage heat from my maintenance guy, Keith Brown. I posted a blog where he showed me how they work. I sure do miss Keith as he was able to fix anything, usually the way my grandpa would have! Pa grew up during the Great Depression and was quite thrifty! Keith, on the other hand, moved to Spain. I, on the other hand, am not moving to Spain any time soon. But this flat is plenty warm and sunny. I love every minute in this place, perched high in the Smithfield Lofts that Yvonne and Shelley designed back in 2006. Last night, I got to tell them how much I enjoy living here. I had braved the lashing rain, trotting across town to pick up new specs at Ace and Tate and then over to Fumbally for an event produced by the magazine Totally Dublin, which ran a feature on them in January 2018 that I still have on my coffee table. The talks weren’t starting on time. Or rather, Irish evening-time tends to run quite behind what the clock face shows. This event ran 8-10 PM, rather than the 7-8:30 PM published. In any case, I had time to grab a slice of cake and get psyched up to hear these amazing architects talk. In the interim, I decided to hop across the room to tell Yvonne and Shelley that I’m a big fan and I love my home. I showed them the photo I took last week from my balcony, which I’d posted in an earlier blog. They seemed delighted to hear their building was loved, as that construction process was rough, with the developer cutting corners and ultimately going out of business when the economy crashed. I’d been told that unfortunate story by my colleagues when I moved in and was glad to help these architects reconnect with their creation. Incidentally, any criticisms I’ve ever had of this building are due to poor workmanship and Ireland’s very strange fire codes. These architects are now world-famous. They curated the Venice Biennale this year, bringing Irish architecture and Irish design to the fore of the world stage. They dedicated the 2018 Biennale to “Freespace,” which I might describe as third-space, public space where everyone is welcome and treated with equal dignity and respect. Last night, Shelley and Yvonne discussed their role in the Biennale and working together since they first met in architecture school at UCD where they graduated in 1974. Imagine, they entered in a class that was gender balanced at the end of the 1960s! Consider that the year Shelley and Yvonne entered architecture school, women were not allowed to study this subject in many universities in the USA, including the University of Virginia (a place Yvonne and Shelley mentioned to me last night). UVA began admitting women in the year 1970. The institution had admitted a few women before this date because they had a medical school that needed nurses; my mom earned a Bachelors in Nursing there at UVA in the mid-60s. What a revelation, to learn there was gender balance in architecture admissions here in Ireland at the same time there were 0% women and 100% men in architecture at UVA! Yvonne and Shelley said they’d never experienced gender discrimination in their lifetimes as architects, designing buildings in Ireland, Peru, Italy, Spain, France…. That was quite inspiring to hear! Yesterday evening also featured discussions with the photographer and artistic director of the magazine’s October cover piece on “The Bumbles” and discussion and performance by busker NC Lawlor, an Irish man reared in Manchester and now living and performing in many types of venues in Dublin. You’ll have to find him busking on Grafton Street if you want to hear him first hand! Below are photos of the evening, along with pics I’ve snapped over time of my cozy flat. Hoping to learn a bit of Irish history today, Aongus and I hiked over to Dublin’s Collins Barracks after brunch. A former military station, Collins Barracks is now used as a museum with decorative arts, WWI and II memorabilia, and even a gun-running ship that was pulled up from the sea floor. It’s also where Aongus did his service in the Irish military once upon a time. To our dismay (and that of five other groups of visitors who arrived at 1 PM) the museum at Collins Barracks opens only 2-5 pm on Sundays. We left disappointed and took the back way out of the Barracks, exiting at Arbor Hill Prison. Finding the Arbor Hill cemetery, next to the prison, open, we decided to venture in. There, we discovered tomb stones of British soldier and their families who served as occupying forces during the 1800s. We also found a memorial to the Irish who lost their lives in the 1916 uprising. The leaders of the Rising were executed in Kilmainham Gaol, across the Liffey river, and then buried in a mass grave here. Following 1916 the Irish continued to struggle against colonial rule, and they gained independence from British in 1922. Later this memorial was built to memorialize their effort. The monument includes the text of the 1916 Proclamation, in Irish on the left and English on the right. Today this memorial park was full of dogs, and dog lovers, from the adjacent Stoneybatter neighborhood. Upon exiting the cemetery on the northern side and into the neighborhood, we discovered a well-preserved WWII tank kept up by a citizen group and had a bit of fun. But after a busy week filled with cold, wet weather, we’d had our fill of exploring. We turned to head for home. We’d driven from work on Friday straight down to Bunclody for RoboSlam workshops and not returned to Dublin until late Saturday night. All this activity caught up with us on Sunday, but the comfort of a warm blanket and a hot tea helped us recuperate for the coming week. Dublin Culture Night happens once a year, offering a glimpse into many cultural treasures this city has to offer. This year, I got to attend the event with my friends Amanda Wagstaff and Frank Daly. 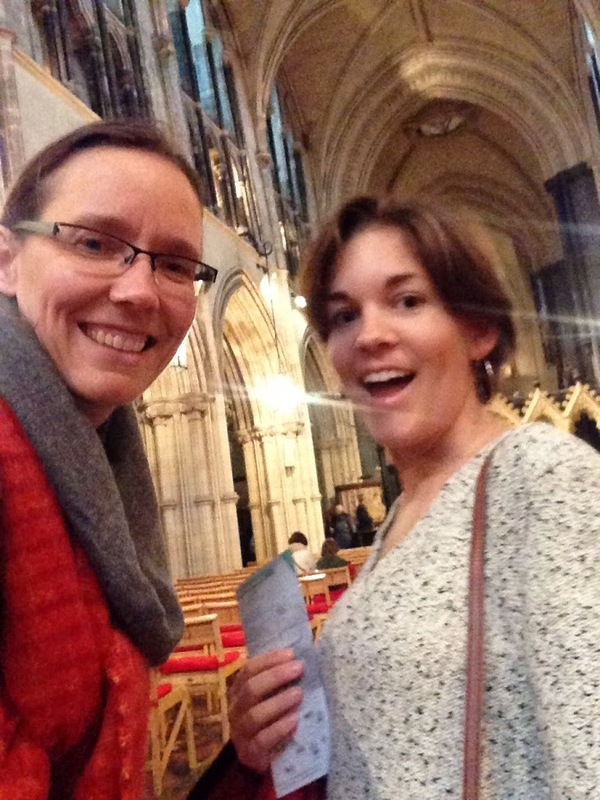 Amanda recently moved to Dublin as a Fulbright student for the 2015-16 academic year. She and I actually graduated from the College of William and Mary on the very same day in 2010–she with a Bachelor of Arts and I with a PhD in Higher Ed. Amanda is a studio artist who is using the archives at the Chester Beatty Library to generate inspiration for her own contemporary artwork. You can see Amanda’s past work on her website, Traipse. Frank’s art and photography is viable on his website and his many Google+ photo albums. 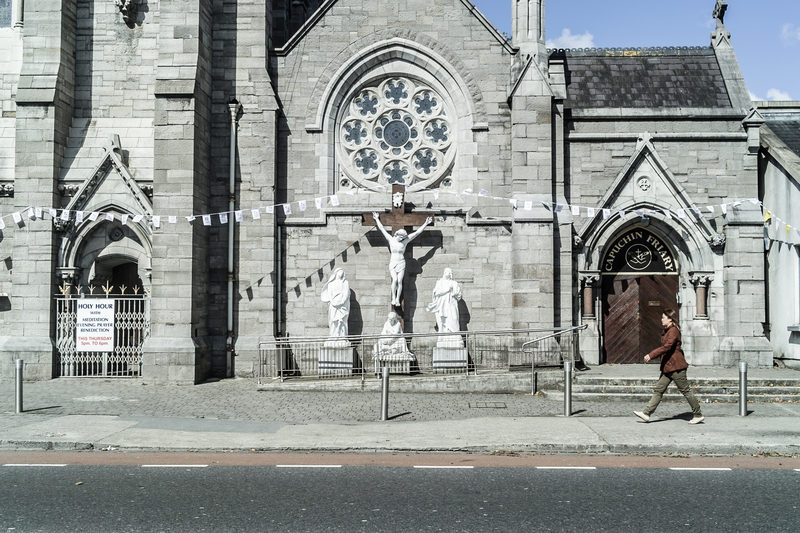 The there of us kicked off our Culture Night explorations at Christchurch Cathedral, not far from my Smithfield residence, and then proceeded eastward to see several more sights. We took in dinner at the Queen of Tarts, Dublin’s stately Customs House, and a guitar concert at the Unitarian Church on St. Stephen’s Green. On my last night in Dublin, my friends came together at the Cobblestone for my “American wake”. Sheila Whelan (Fergus’ wife) originally suggested the idea. She told me that when someone leaves Ireland for the US, the Irish traditionally hold a wake for them. In older days when people, like my great-grand mother, set sail for the States, a wake was held since the person wasn’t expected to return. Thankfully, flying has made the return trip much easier! When I explained I wanted to return, Sheila said, “no worries!” Evidently, my return will give us a reason for a welcome back party! I’m hoping for one of those on my November visit. The Cobblestone pub in broad daylight. refers to a gathering in an Irish home the night before a family member emigrated to America, in which friends and family would say goodbye to the emigrant for what was probably the last time. American Wake is the first full-length solo album by Patrick Clifford, released in 2010. Thanks to my many friends who came to the wake, and to others who sent well-wishes from their summer vacation destinations. Nancy Stenson and her friends from Minnesota, John and Robin. John and Robin sang a number of songs at my “American wake.” They were headed home the next day, too. Robin, John, Nancy, and Fergus in the musician’s corner for the Wednesday night early set. Mick O’Grady organizes the early set. Here are my new friends, Sylvia and Alessandro, who also play on Wednesdays. Tom and Tomas Mulligan, dancing behind the bar. Fergus usually sings on Wednesday and Friday, during the early sets (7:30-9:30 or so). Eventually Jerry Crilly arrived, and shortly after that Frank and Carmel Cullen came around. Here, Jerry is leading a song. Frank and Jerry make a dynamic duo. And Fergus keeps everyone up-to-date on historical research. Here Tom and I are, posing with the “urban reflection” photo I gave him. This wake was a wonderful way to wrap up a year in Dublin: at the Cobblestone pub with some of my best friends in the city. Thanks to them all for their love and support. There’s always something new and imaginative going on in Dublin. Just before I left for Rome, I had a meeting at the Irish University Association building on Merrion Square. Walking through the park after my meeting, I got to see workers setting up for weekend events for kids. The the menagerie wire animals and the tree covered in a giant sheet fascinated me. There’s a beautiful Capuchin Friary right near my apartment in Dublin. The wooden ceiling is spectacular. The photos I have on hand right now don’t do the place justice, so I’ve included two that I found on line as well.